Physically and culturally straddling two continents, this vibrant megalopolis of more than 13 million is new and old, gritty and glamorous, secular and devout — a city of contrasts. Best of all is Istanbul's swoon-inducing location on the hilly shores of the beautiful Bosporus strait that divides the city into Europe and Asia. Add to that the cultural legacy of two empires (Byzantine and Ottoman), scenic waterfront hot spots, and ancient bazaars crammed with silks, ceramics, and jewelry, and you have the most irresistible stopover in Europe. If time is short, devote at least half a day to the historic Sultanahmet district — Hagia Sophia, Blue Mosque, and the Topkapi Palace are musts — but leave time to soak up the local scene on the Bosporus. But don't stop there. 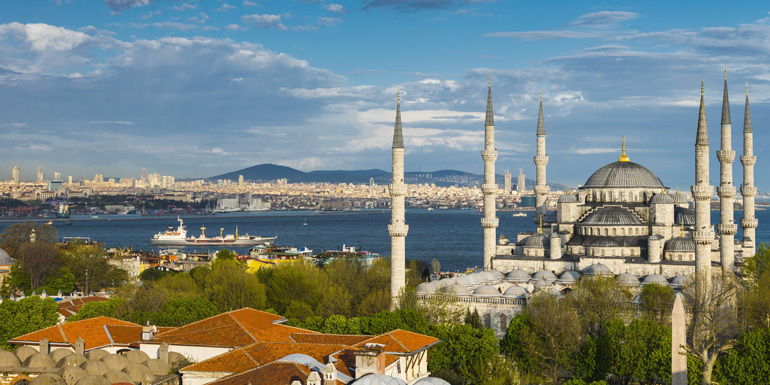 Here's our list of the top things to do in Istanbul. Splurge: Four Seasons at the Bosphorus – Delivering a tranquil resort vibe in one of the world’s busiest cities, this waterside property is a perfect complement to Istanbul’s first Four Seasons in the bustling Old Town, and moving between the two is encouraged. Hugging a prime patch of the Bosporus shore, the hotel occupies a remodeled 19th-century Ottoman palace flanked by two modern wings — all set amid green landscaped grounds. The sultan-meets-CEO décor in the 170 ultraplush rooms features neutral palettes offset with traditional touches like hand-painted ceilings and custom-made kilims. Underwater music at the skylit indoor pool feels particularly soothing after a day of sightseeing. Or skip the sightseeing and lounge by the outdoor pool, watching ferries glide by on the water. Doubles from $475. 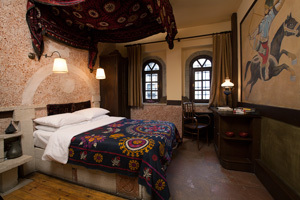 Steal: Empress Zoe – An olive’s toss from the majestic bulk of the sixth-century Hagia Sophia (a Byzantine basilica-turned-mosque-turned-museum), this romantically quirky inn has 25 rooms and suites across several townhouses near the evocative ruin of a 15th-century bathhouse. Some of the larger rooms have tiny gardens or terraces with views of the Marmara Sea. But even the basic doubles are appointed with comfy beds under antique textiled canopies, warm weathered wood, and organic toiletries. The hotel enjoys cult popularity, so book way in advance. Doubles from $190. Mikla's modern fare gets creative plating. Breakfast: Namli Gurme – Breakfast is the locals’ favorite meal — and no wonder. What can beat the yummy (and healthy) Turkish spread of briny cheeses, crinkly olives, crunchy cucumbers, and jams in flavors like sour cherry and quince, all washed down with strong tea sipped from tulip-shaped glasses? The city’s best-loved morning spot is this fragrant deli in the happening Karakoy district. Ordering’s easy: Just point to what you want on the counter. Pick up the fried eggs with spicy soujuk sausage, and then tote your plate to a shared wooden table. Arrive early to snag a coveted outdoor seat with a view of the water, and save room for the city’s best pistachio baklava at the legendary Gulluoglu next door. Lunch: Kantin – Take a quick cab ride to the chic Nisantasi shopping district, which resembles Paris, to sample Chef Semsa Denizsel’s light, locavore fare. Often called the Alice Waters of Turkey for her commitment to the regional-seasonal ethos, Denizsel indulges her stylish regulars with daily changing market selections scrawled on the blackboard. The elegant space decorated with globe lights and flowers sets the scene for a fresh local lufer (bluefish) touched with ethereal olive oil or spoon-tender lamb braised with greens. The restaurant doesn’t take reservations, so arrive around opening time and stock up on crusty breads and crumbly cookies at the downstairs deli. 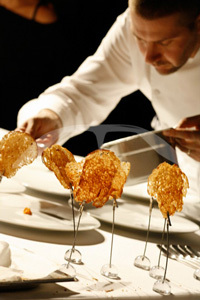 wood, Mikla is the city’s most confident modern restaurant. Celebrity Chef Mehmet Gurs — he’s half Turkish, half Swedish — combines Nordic minimalism with native ingredients sourced for him by an anthropologist who roams the country in search of artisanal foodstuffs. The prix fixe dinner might progress from succulent slow-cooked grouper with roasted tomatoes heightened with fig vinagrette, to an ultrasmooth bulgur (yes, bulgur!) ice cream with sun-splashed Malatya apricots. Desert: Haci Bekir – Impervious to the globalized frenzy of Istiklal — the pedestrian thoroughfare in the Beyoglu district — this dollhouse-like confectioner has been satisfying the city’s sweet tooth for more than two centuries. Local ladies on their way to a dinner party buy exotic candies like bergamot-flavored akide and handsome boxes of Turkish delight in flavors like mint and pistachio. If you’d like a taste before you buy, there’s a small cafe in the back. Tip: The formerly gritty Karakoy district has been gentrified into a happening hot spot. Try the stunning fish at Karakoy Balikcisi, with equally stunning views ; herbed zucchini fritters and other small plates at the stylish Lokanta Maya ; and panoramic cocktails at the rooftop bar of the Gradiva Hotel. The Grand Bazaar takes the better part of a day. For Everyone: Grand Bazaar – A city within a city, this 15th-century covered bazaar is an endlessly fascinating warren of stalls, shops, ancient courtyards, and workshops. Sure, there are plenty of kitschy evil-eye souvenirs, but locals do go here to buy quality gold along the Kalpakçılar road, snag fashion-forward jackets at Koc Leather, carpets from venerable dealers like Adnan & Hasan, and hand-woven textiles and natural bath products from Dervis. Don’t miss the Ottoman-era antiques inside the vaulted Bedestan section. Hungry? Follow the goldsmiths, rug lords, and copperware kings to the homey Subaşi for a bowl of fortifying white bean stew. The Grand Bazaar demands at least several hours, so if you’re in a hurry, consider the outdoor Arasta Bazaar by the Blue Mosque, which has terrific silk scarves and soft shawls, Iznik-style ceramics, and a decent carpet selection. For Couples: Ayasofya Hurrem Sultan Hamam – A Turkish steam bath is a must when in Istanbul. But while most historic hammams are short on service, this one provides proper pampering as well as pummeling. The graceful domed building between the Blue Mosque and Hagia Sophia was constructed in 1556. In 2011, it emerged from a $10 million renovation decked out with acres of cool Marmara marble, gold-plated faucets, and a tour de force galleried, cedarwood cold room. After your treatment, linger in the relaxation lounge over dainty Turkish delights and refreshing Ottoman sherbets (drinks) while a muezzin cries in the distance. For Families: Basilica Cistern – Who needs theme parks when you can descend into the dark, mysterious expanse of this underground water cistern dating back to the Byzantine times? (It’s been featured in “From Russia with Love”). The 336 marble columns supporting the roof are amazing. There’s music and light, fish flitting in water, and — at the very end — a stupendously creepy upside-down marble head of Medusa. For the Adventurous: Ferry – The most authentic way to experience Istanbul is catching the white public ferry — for just over a buck — at the Eminönü docks on the Golden Horn. In warmer months, board the early evening Bosporus commuter route that takes you past hilly green shores and Ottoman summer palaces, disembarking in the charming village of Emirgan. From there, a short cab ride — or bus — takes you to the chichi Bebek village for a perfect gin tonic at the Bebek Hotel. Then stroll along the shore to Arnavutkoy, with its ornate waterfront villas, for fried local fish at Adem Baba restaurant. Buy a dense, sesame-crusted bread roll called simit before catching the ferry, to go with the tea served onboard. To avoid Istanbul’s notorious traffic — and greedy cab drivers — travel by tram, which stops at the Grand Bazaar, Blue Mosque, and the Topkapi Palace. Sightseeing? Get off at the Eminonu stop, and walk across the Galata Bridge to the happening Karakoy district. What do you like to do in Istanbul? We’re so glad our article could inspire a trip to Istanbul, DongShao! To help with your planning, you should also take a look at the city tours that are available in port at http://cruiseline.com/excursions/port/istanbul-turkey. The tram is an inexpensive way to get around. Study the attractions and their locations carefully. I was approached the moment I got off the tram by a young man offering to guide me to the Basilica Cisterns, which were clearly marked as being just 80 meters away. If you cross the Galata Bridge on foot, do not miss the lower level with it's shops and restaurants. 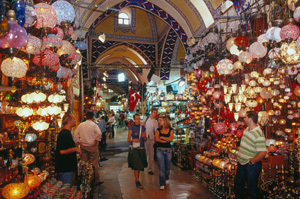 The Grand Bazaar is quite a sight, but you still must be wary when shopping there. You cannot buy authentic Iznik pottery for TL 15, no matter what the signage might suggest. A little harder to find tha The Grand Bazaar, but just a short was off is the Egyptian Bazaar near the Galata Bridge. This "L" shaped building is easier to navigate and has shops carrying about anything you might want.